Yesterday while I was busy in the kitchen, I was saying loud , that it is ages ago I baked something sweet anf I heard someone ( hubby) loudly saying from the living, thank god for that. 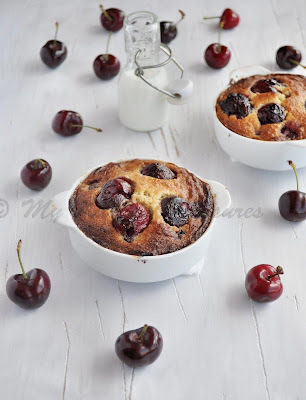 So I thought I will post this Cherry Clafouti which I made 2 months back and forgot to post . This is one sweet hubby loved as it is not that sweet and I served with whipped cream which he loves. Clafoutis, sometimes in Anglophone countries spelled clafouti, is a baked French dessert of black cherries arranged in a buttered dish and covered with a thick flan-like batter. The clafoutis is dusted with powdered sugar and served lukewarm. In a small bowl, toss the pitted cherries with 2 teaspoons of the sugar and 1 tablespoon of the Kirsch. Set aside. Adjust an oven rack to the lowest shelf and preheat the oven to 400 degrees F. Butter a 9-inch round Pyrex baking dish. Place the remaining 1/2 cup sugar and the butter in a small bowl. Using an electric mixer at medium speed, cream the mixture until light and fluffy, about 5 minutes. Beat in the egg yolks and egg, 1 at a time, at 1-minute intervals, scraping the sides of the bowl occasionally. Reduce the speed to low. Blend in the almond extract and the remaining 1/4 cup kirsch. The mixture will look curdled. Mix the flour and ground cloves and add all at once, scraping the sides of the bowl again. Increase the speed to medium low and mix until the batter is smooth, approximately 30 seconds longer. Take care not to overmix. The batter will have the consistency of thick cream. Place three-quarters of the cherries and their juices in the bottom of the baking dish. Spread the batter over the fruit. Arrange the remaining fruit on top. Bake until the cake is golden brown and puffed, and a bamboo skewer inserted in the center comes out clean, 30 to 35 minutes. Remove from the oven. Cool in the baking dish on a rack. Serve warm with whipped cream. I made them in individual pans. Delicious and incredible cherry clafouti..
Lovely presentation. Looks so tempting. I discovered your beautiful site a few months ago via foodgawker (I think) but then I couldn't find it back anymore even though I searched for it... Now I found it back via "blogs culinaires belge"s on facebook and I am really happy :-)!!! Well captured, such a sweet treat with cherry! Thanks for the kind words on my space. 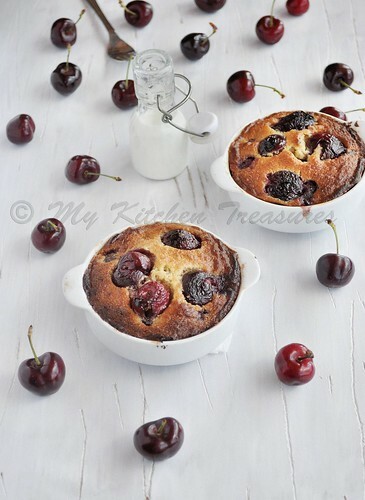 Cherry clafouti looks attracting and giving a pleasant look. what a fine bake- loving it ! That's an interesting tidbit about the pits adding more flavour. It really looks delicious. This looks so delicious. I love it! Gorgeous clafouti with cherries. Adore the color of the cherry always. This is exceptionally good dear. Love it. Thank god you remembered to post it after two long months :) Else we would have missed such a fab recipe. Those are the cutest little clafoutis ever - surely they converted your husband to the sweet life! beautiful picutres & very nice recipe. Thanks for sharing. first time here and loved the cherry clafouti....i love the spicy nutty flavor in a dessert! !